The military history of Argentina spans a period of over two centuries. During the course of those years, it broke colonial ties with Spain, waged a civil war to define its organization and wars with Brazil, Paraguay, Britain and France. The military also played a role in the institutional life of the country, during a series of coups d'état that took place in the 20th century. One of the first notable military conflicts taking place in modern Argentina were the British invasions of the Río de la Plata, involving both Buenos Aires and Montevideo (currently part of Uruguay). As part of the Napoleonic Wars, a British force led by William Carr Beresford occupied Buenos Aires on June 27. The French Santiago de Liniers moved to Montevideo and led the forces that would reconquer Buenos Aires on August 12, 1806. The Viceroy Rafael de Sobremonte, who had fled from the city to Córdoba, was not allowed to return, and Liniers was trusted to organize the defense of the city against a possible British counter-attack. For this end he drafted all men capable to bear arms, regardless of their social condition (including slaves), and formed militias to defend the city. The Regiment of Patricians, composed of criollo people, was created during this time. The second invasion took place the following year. A new British army, much bigger than the first one, invaded first Montevideo and then moved to Buenos Aires, led by Lieutenant-General John Whitelocke. The British found a strong resistance and were forced to surrender, and return Montevideo to the viceroyalty. As a result of the invasions, Sobremonte was removed as viceroy, and replaced by Liniers. The Regiment of Patricians, led by Cornelio Saavedra, became a strong political force in Buenos Aires, and was instrumental to the failure of the Mutiny of Álzaga and the success of the May Revolution. 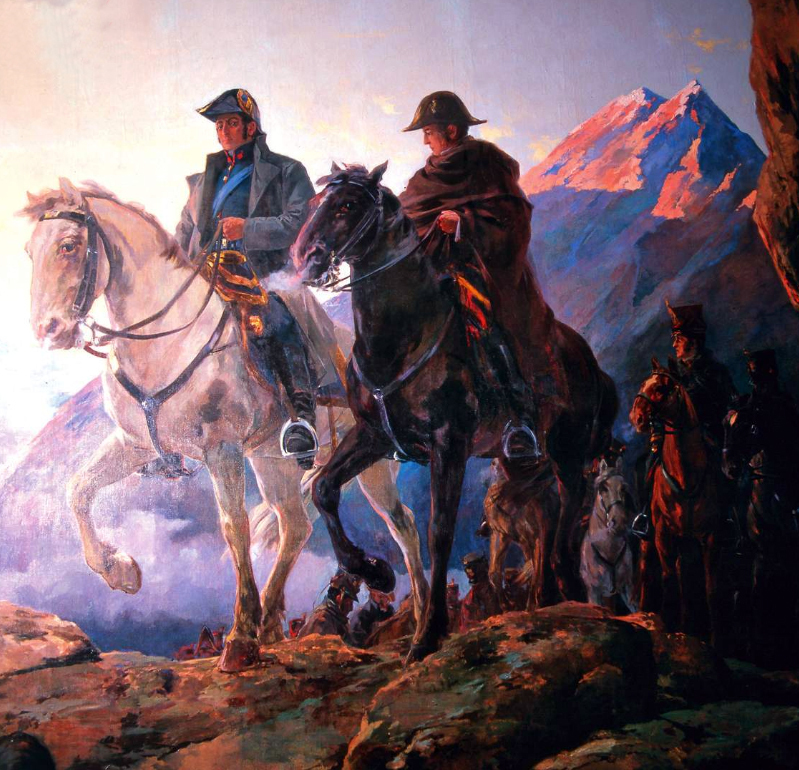 The Crossing of the Andes led by José de San Martín and Bernardo O'Higgins. The May Revolution ousted the Viceroy Baltasar Hidalgo de Cisneros and replaced him with a junta, the Primera Junta. The viceroyalty was also renamed, removing the "viceroyalty" word from it, and it nominally became the United Provinces of the Río de la Plata. However, the status of the different territories that used to belong to the viceroyalty changed many times during the development of the war, as some regions would remain loyal to the former organization, others were captured or recaptured, and later they would divide into several countries. The first military campaigns against the royalists were waged by Manuel Belgrano and Juan José Castelli. The Army of the North led by Castelli was headed first by Ortiz de Ocampo and defeated a counter-revolution organized by Liniers at Córdoba. Castelli took command to enforce the execution of the captured royalists, and then moved to the Upper Peru. He took control of it for a brief time, and was defeated by Goyeneche at the Battle of Huaqui. Belgrano led an ill-fated campaign to Paraguay, and created the Flag of Argentina when preparing the defenses of Rosario against a possible attack from the Banda Oriental (where Montevideo was under siege by Artigas). Belgrano led a new campaign to the Upper Peru, achieving military victories at Salta and Tucuman, but being defeated at Vilcapugio and Ayohuma. By this time José de San Martín arrived to Buenos Aires with other generals of the Peninsular War. They gave new strength to the Revolutionary war, which was compromised by the defeats of Belgrano and Castelli and the royalist resistance at the Banda Oriental. Alvear took Montevideo, and San Martín started a military campaign that would span across an important part of the Spanish territories in America. First, he created the Regiment of Mounted Grenadiers and defeated a Spanish raid at the Battle of San Lorenzo (the only battle that San Martín fought in Argentine territory). He created the Army of the Andes in Mendoza and, with help of Bernardo O'Higgins nd other Chileans he made the Crossing of the Andes and liberated Chile. With the Chilean navy at his disposal, he moved to Peru, liberating that country as well. San Martín met Simón Bolívar at Guayaquil, and retired from action. The Congress of Tucumán was called while San Martín was preparing the crossing of the Andes. It declared independence from Spain or any other foreign power. 1825: The Argentina-Brazil War over the control of Uruguay, then called Banda Oriental, began. It ends with the independence of Uruguay in 1828. November 20, 1845: Anglo-French blockade of the Río de la Plata. Combined forces from the United Kingdom and France seized control of the Paraná River in order to establish trade relationships with Paraguayan ports blocked by Argentina. The Army of the Argentine Confederation, commanded by General Lucio Mansilla, expelled the invaders causing severe damage to the 11 warships by shooting from both river's shores, at the cost of 150 Argentines killed and 90 wounded. Although the invading troops took less casualties (26 killed, 86 wounded), they decided to leave in order to preserve the remaining ships. It was the last attempt on Argentine rivers by the Royal Navy. 1864–1870: War of the Triple Alliance. Argentina, the Brazilian Empire and Uruguay invaded and routed the militaristic Paraguay of Francisco Solano López, after the strategic Rio Grande do Sul in Southern Brazil was invaded. 1870s: The Conquest of the Desert, a military campaign directed mainly by General Julio Argentino Roca, established Argentine dominance over Patagonia. 1879: The Hydrographic Service was established. 1907: The South American dreadnought race between Argentina, Brazil and Chile started. It ends in 1914. 1912: The Argentine Army Aviation created the Army Aviation School at El Palomar, Buenos Aires. 1914–1918: Argentina remained neutral during World War I by decision of President Victorino de la Plaza. Hipólito Yrigoyen kept a similar policy. It is considered that staying neutral boosted the Argentine economy. Yrigoyen also pointed out that he wouldn't send the country to war because of the fact that a diplomat insulted him, nor that Argentina's foreign policy was decided by the United States. 1919: The Argentine Naval Aviation was established. 1921: The Argentine Army was used to eliminate strikers in Santa Cruz. Lt. Col. Varela commanded the operation. Between 1,500 and 3,000 workers were executed. 1930: General José Félix Uriburu made a coup d'état and became the first de facto President of Argentina. The military continues overthrowing civilian governments until 1983. 1933: The Argentine Submarine Force was established. 1939–1945: World War II. The civilian government considered joining the allies, but many officers in the armed forces and ordinary citizens objected due to fears over the spread of communism. This was a factor contributing to the military coup of 1943. Pedro Pablo Ramírez, who had been attached to the Kaiser's army and later Mussolini's in the twenties, became dictator. In 1944 he was replaced by Edelmiro Julián Farrell, who had spent two years attached to Mussolini's army. The government maintained a neutral policy but towards the end of the war, Farrell bowed to intense pressure from the United States. Like several Latin American states, Argentina made a late declaration of war against Germany. 1959: The ARA Independencia (V-1) became the first aircraft carrier of the Argentine Navy. 1974–1983: The Dirty War, a period of state-sponsored violence, occurred. 1978: After Argentine repudiation of an obligatory arbitration to settle a territorial dispute with Chile concerning the Beagle Channel, General Jorge Rafael Videla moved troops to the Andes mountains. The Argentine Operation Soberanía to invade the islands was stopped with mediation from the Holy See. The crisis lasts up to 1984, over the Falklands War. ). The Argentine Armed Forces invaded the Falkland Islands. In a ten-week war 255 British and 649 Argentines were killed. The war ended with Britain reclaiming the islands. Argentina's defeat caused the collapse of the military junta. 1990s: Argentina became greatly involved in UN peacekeeping missions around the world. 1991: Argentine Navy ships and Air Force transport aircraft participated in the 1991 Gulf War. Argentina was the only Latin American country in the coalition. 1993: Argentina joined the UN Peacekeeping Force in Cyprus replacing the Canadian Forces. As of 2010, ground troops and helicopters continue serving and since 1999 have other Latin American troops within their ranks. 1995: The murder of young conscript Carrasco caused the end of compulsory conscription. Decree 1537 of 29 August, signed by then President Carlos Menem, established a Regime for Personnel of Professional Soldiers. Ever since people of 18 to 24 years of age can, after signing a compromise, voluntarily enter the Armed Forces and receive a course. Law 24429 of Voluntary Military Service was passed by Congress on December 14, 1994. 1998: In recognition for her peacekeeping efforts, US President Bill Clinton named Argentina a major non-NATO ally. 2006: The National Defense Law was passed, making a breaking point in jointness and civilian rule on defense matters. 2008: Cruz del Sur, a combined force with Chile for UN operations, was created. Current: Participation in UN peacekeeping missions continues (particularly in Cyprus and Haiti), as well as regional integration efforts with Brazil and Chile.